Prominent & Leading Manufacturer from Kolkata, we offer stirrer machine and laboratory stirrer. This is very ideal and economical machine for making small batches of different liquid materials. This is a very efficient machine for mixing and dispersing of different materials into the liquid. 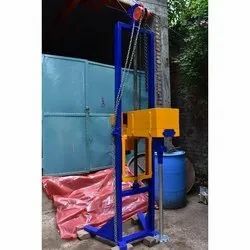 The machine top head can be lift by chain pulley block and can vary the rpm by speed inverter. Our range of Laboratory Stirrer is very useful in mixing the liquid syrups and pastes. These stirrers are used to mix the liquids and pastes thoroughly with the help of blades attached in it. It comes with a jacketed arrangement and is used for heating the substance if required. Looking for Stirrer Machine ?